i've been drawing a lot of 'suzi faces' lately... i bought suzi blu's new book because i wanted to learn how she gets her girls to look the way they do. really, it had escaped me! and that's probably because symmetry is a key ingredient. symmetry!! well yeah, that's off my radar! i've practiced suzi's techniques pretty extensively and i'd like to give away my gently used copy of the book so that someone else can benefit from it. i highly recommend it for learning about shading around the eyes (and the face in general) *and* it's just a lot of fun! if you'd like to have your name placed in the hat, just say so in your comment. be sure and let me know your e-mail addy if you don't have one associated your blogger account. i'll draw a name on saturday and try to post the results soon thereafter! colored pencils, watercolors and gouache in stillman and birn 'alpha' ~ 8 1/2" x 11"
the face at the top of the page was my first try, following suzi's directions exactly. i liked her alright, but not enough to make me want to paint her hair in, lol. the face on the bottom of the page was next and i liked her except she looks like she just swallowed a handful of tranquilizers. this time i followed suzi's instructions but i used my choice of colors instead of hers. also, her colored pencil hair was awful so i painted over it with gouache. the cat on the right was next and i used watercolors instead of colored pencils - suzi uses 100% colored pencils for the faces in the book. the face on the left was last and i used colored pencils and watercolors for her. she's okay except her right eye is way too big (symmetry, remember). the next day i used colored pencils in the stillman and birn 'epsilon' - it's the one with the super smooth paper and i wanted to see how suzi's technique worked on it. although the girl/cat is strange (that smile), the paper was great for her technique. colored pencil and watercolors in stillman and birn 'gamma' ~ 4" x 6"
this gentle soul is in my 'daily book' and i used mostly albrecht durer watercolor pencils to paint her. a little colored pencil on the cheeks and around the eyes, but that's it. also these are not true 'suzi eyes' because i just drew the top line of each eye in and let the shading define the lower line. it doesn't come easily to me to draw two identical almond shaped eyes; this way is a lot easier (and more fun!) for me. the girl at the top of the post is my latest, and for her i used cream caran d'ache oil pastel for the skin, then i used colored pencils and sennelier buff titanium oil pastel for shading. 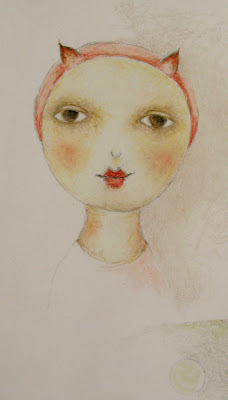 at the end i used watercolors on her lips and eyes. i really liked this combination. these are most of my suzi faces... let me know if you have any questions. as i said, i highly recommend this book for learning more about drawing faces in general, and shading in particular. my sweet books! i clipped the faces by anne grgich from the latest slotin folk art auction catalog. I'm a recent follower of your blog and I am thoroughly enjoying it. I love the fact that you study other artists to help you learn new techniques and inspirations. What a great idea. These are fun! Love how you added your techniques to Suzi's... just goes to show ya, there are no rules in art. Of course they're wonderful and I can plainly see your hand in them, but your faces speak to me more loudly than any, cough, symmetry. 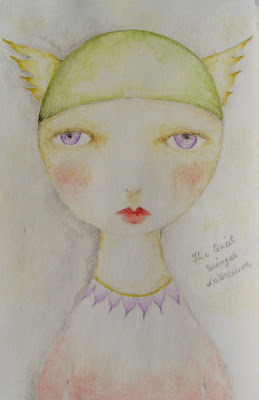 yes, her hair is watercolors; i used albrecht durer watercolor pencils for it. two layers to make the color more dense. as for using oil pastels with watercolors, try it!! you'll like it, hee! Pretty please with sugar on top put my name in the hat. 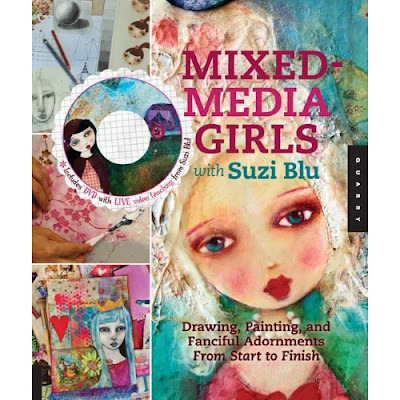 Suzi's book is on my list. Gonna keep my fingers and toes crossed. And gotta say those catalogs look yummy...your sweet faces always pull me in. I want to come over and have a cup of tea with them, maybe a scone or 2. Lynne, too funny! I was just saying to myself I need to learn how to do a portrait and here is your offer for give away! Please put my name in. Thanks. I admire you for working so hard to try a new style. Thanks for sharing these practice faces. It's interesting to see how you've made each one your own. We should be buying your book on how to draw faces! The 'symmetry' on your faces is delightful & so uniquely you! It's funny because I am taking an online portrait class now - trying to learn about shading and values. It's certainly not easy to make identical shaped eyes and who knew that ears line up a certain way? So much to learn - good thing it's all so fun! In my opinion, your art really shines when you use the mix of materials that you feel most comfortable with. I think that's true for everyone. It's so wonderful that all these art technique books give us the opportunity to learn how artists do what they do. But then it's up to each person to find their own techniques and style. Yes, there is an immediacy, visual satisfaction, and accepted beauty in symmetrical. I have a long-time collaborator whom goes to symmetry FIRST, and that is good play for me ... because I (and sounds like you too) do not think symmetrical naturally, asymmetrical comes out and I need to work at finding a symmetry. It can be true, though, in art as in nature — the most striking face is symmetrical. These are stunning, kind of haunting like all your works, symmetry or no; and its pretty fantastic how you have interpreted the work but kept it your own. You are such an inspriation. I always enjoy seeing your faces on the blog, but who wouldn't want to learn a new technique. Thanks for offering the book. it is you i would love to place my soul under the wing of. until then i will glean all i can from your inspired art and generous wisdom. you are a torch of beauty i am eternally grateful for! Well, if there's one thing I could stand to get batter at, it's faces, so throw my name in that hat and thanks for the giveaway. I quite like the cat girl. Hmmm, I like suzi faces done by lynne but I love the less symmetrical, more "organic", more lynne hoppe peeps better. They are uniquely yours and perfectly imperfect. But I can see how learning the techniques that suzi uses in shading, blending, etc...are fun to learn. Love how you added cat fun to the girls too ! Hope the spring days are being kind to you ! Light and love, Talented One ! Thanks for this, it's a book I have been dithering about adding to my wishlist so it's good to read what someone who actually read it thinks. I'd love to take part in your giveaway :) Thank you. p.s. by the way, I've never thanked you for the chatter you do about materials and supplies and I want you to know I love that because then I can explore those paths on my own. Ciao! Thanks for all the explanations on your blog posts. 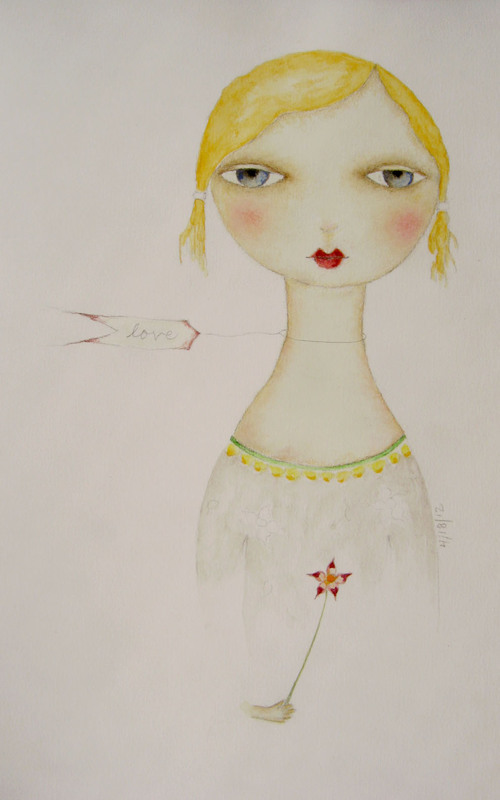 I love to read them and I love your paintings a lot, especially the ones on old book pages. 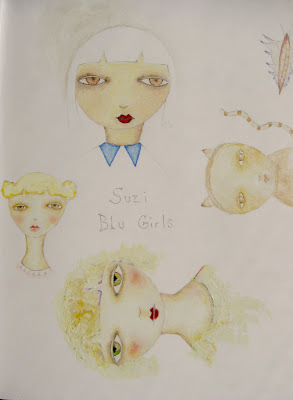 I would like to be able to draw faces too so please put me in the draw for Suzi Blue's book, thank you! 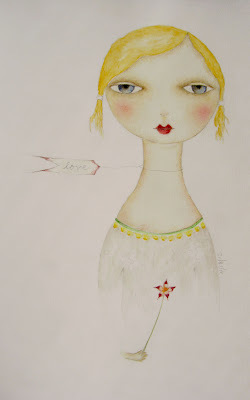 Hi Lynne, I like all your drawings - but I love, love, love!!! the original non-symmetry ones - those express so much and tell so many secrets! i love suzi stuff, and i would be most stoked to win your suzi book. i really like the idea of giving away art books after we've finished with them. that's a good idea. Yes please, put my name in the hat for the drawing. I always enjoy seeing what you are up to. I liked reading your comments that were in The Pulse. I already gave away my copy of that book but enjoyed reading it. I am that girl, you know, the one with her arm striaight up in the air, waving frantically, holding her upraised elbow with the other hand, saying, "oh, pick meeeeee, pick meeeee!". I have the glasses and could probably find an old style blouse in my closet that is red plaid, Peter Pan collar optional....oh, why yes, she said, slightly startled, I would like to be included in the drawing for the book. I love the cat girl best! Please put my name in the hat...i have all these colored pencils, and no idea how to use them! Thanks for sharing your ideas about Suzi's book. 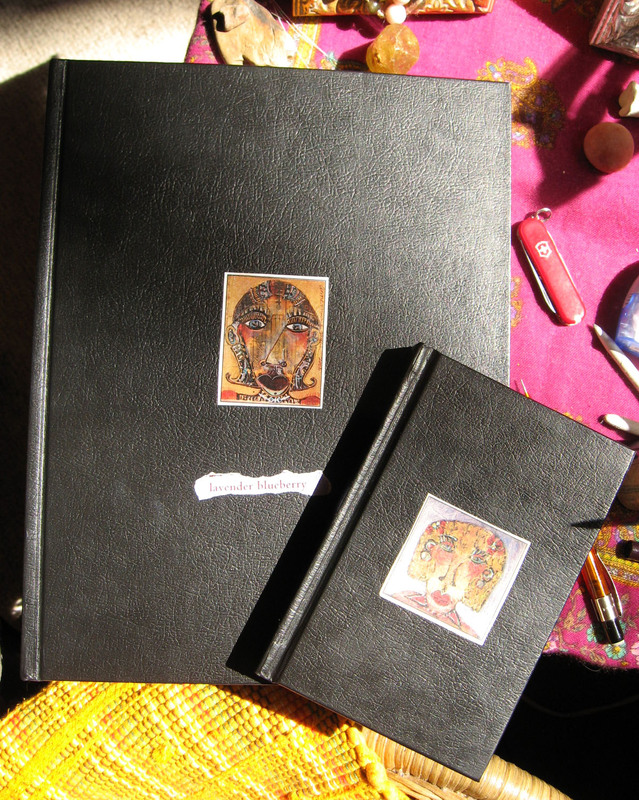 I recently signed up for her Goddess & Poets self-guided class. The book is next on my list. I enjoy reading your posts and love your art work. Hi Lynne! How fun this post is...and look at you, venturing out. Your last two "Suzi" faces are sweet with your special touch. I love them. I just gotta gently repeat what another comment said, probably better. There are many Suzi-looking faces out there, but only one place I find the wonderful soul filled Lynne faces.